It’s no secret. Everybody knows summer is coming every year. It’s also no surprise that it’s going to get hot. Really Hot! And when it does, you’ll need a way to cool your employees down so they can continue to be productive. While it’s no secret that it’s going to get hot, we still see customers waiting way too long to purchase these evaporative shop cooling fans. They wait until the heat is already here. While you still have plenty of time to take advantage of our great deals, time is running out. If you want to enjoy the benefits of one of these fans for the entire season, you need to order one now. It can take a week or two to get one shipped out to you, depending on the model and availability at the time of the order. If you’re not familiar with these portable evaporative shop cooling fans by CoolSpace, they are a unique way of cooling off your auto shop. They are much more effective at cooling you off than a standard fan, but are less costly to purchase and operate than air conditioning. You’ll see these types of fans all over the place;, even on the side lines of major sporting events where you’ll see athletes attempting to cool off before the next play. You can view more about them on our web site. But remember, don’t wait any longer. If you do, you’ll find that summer has passed you by. It’s hot right now! Hurry! Don’t wait! Act Now! 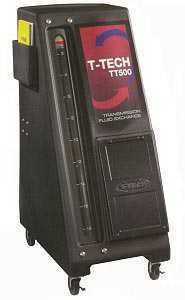 We wanted to get your attention because we have a limited time offer on our TTech transmission fluid exchange machine. You really don’t want to miss out on this one. We told you this was a killer deal. The combined free products add up to over $1500. How do we do it? Who knows? Who Cares? Just take advantage of this offer while you can! This is a deal that is truly too good to pass up. The TT500 is our best transmission service machine. And TTech is the best name in the business. You have until June 30 th only. Do not let this deal pass you by. You’ll be kicking yourself later. This month’s winner has been announced. It’s Ernest Jensen from Bayshore, NY. Every month, customers who have purchase an automotive lift of any kind or type from us can submit a picture or two of their lift after it’s been installed in their professional garage, or their home garage. Once entered, we perform a random drawing. The winner of this drawing wins a prize typically valued at about $150. The prize this month is an ES2500 Battery Booster Pac. The details about the winner? As indicated previously, it’s Peter Jensen from Bayshore, NY, and he submitted several pictures of his Dannmar MaxJax portable mid rise two post lift that he purchased a few weeks back. Pete said, “Here are some pictures of my MaxJax Lift that I bought. It fits my garage perfectly, and it makes a great addition to my shop”. You can check out some of the pictures he sent us below. If you are not familiar with the Max Jax Lift, it is one of our most popular car lifts. It has the ability to be mounted to your garage floor, and then used to service your vehicle, and then you can dismount it, and store it away in the corner of your shop where it’s out of the way. It is a truly unique lift with all the features of a quality two post lift, and then some. Plus, it’s on sale right now. Our customers are jumping all over this deal. Give us a call today with any questions you have. You are currently browsing the Car Lift Blog blog archives for June, 2012.